Radio Goes to War is the first comprehensive and in-depth look at the role of domestic radio in the United States during the Second World War. 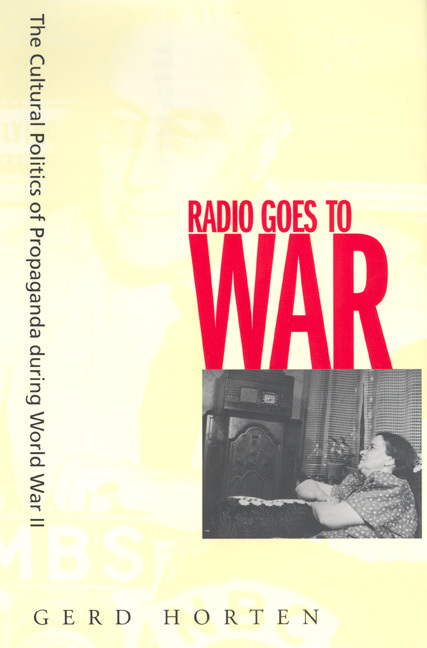 As this study convincingly demonstrates, radio broadcasting played a crucial role both in government propaganda and within the context of the broader cultural and political transformations of wartime America. Gerd Horten's absorbing narrative argues that no medium merged entertainment, propaganda, and advertising more effectively than radio. As a result, America's wartime radio propaganda emphasized an increasingly corporate and privatized vision of America's future, with important repercussions for the war years and the postwar era. Examining radio news programs, government propaganda shows, advertising, soap operas, and comedy programs, Horten situates radio wartime propaganda in the key shift from a Depression-era resentment of big business to the consumer and corporate culture of the postwar period. Gerd Horten is Associate Professor of American History at Concordia University in Portland, Oregon.